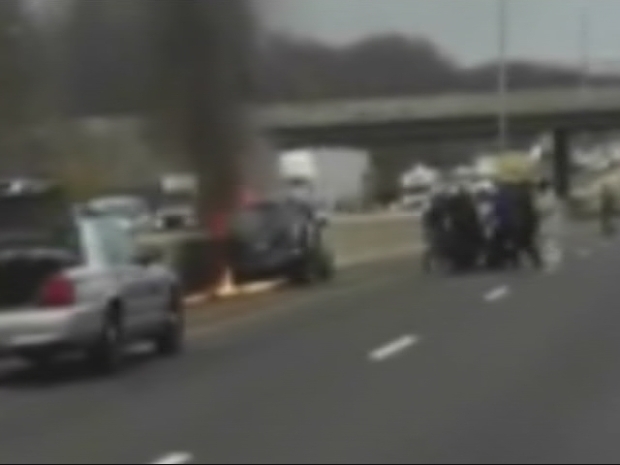 A man was rescued from his burning car along I-84 in Waterbury. Michael Lawrence and Edward Clini were each driving along I-84 in Waterbury on Tuesday when they saw a burning minivan, which had crashed into the barrier. Both men noticed the driver, Randall Baker, 42 was unconscious and stuck inside. “When I looked in the car he was on fire,” said Lawrence. Instincts then kicked in. They broke the window and door and reached across the passenger side to pull him out. A good samaritan came to the rescue of a driver trapped inside his burning car on I-84. The victim is now thankful for those who risked their lives to save his. “At that point I grabbed his right wrist with my hand and hooked him up under my armpit and with all my might I started pulling,” said Lawrence. Cell phone video showed the off-duty Woodstock firefighter and several other good Samaritans carrying Baker away from the burning van. In his seven years as a firefighter Lawrence says he’s never seen anything this bad. “This being the first dramatic rescue I’ve had to do, it’s like something out of Hollywood,” said Lawrence. Baker eventually regained consciousness and was taken to the burn unit at Bridgeport Hospital. Lawrence may not consider himself a hero, but his daughter, who hopes to follow in her dad’s footsteps, would beg to differ. “Angels come in weird forms sometimes and yesterday one jumped on my back and gave me the power to help a fellow citizen,” said Lawrence. Randall Baker suffered burns to 30 percent of his body. He told NBC Connecticut on Wednesday evening that he’s holding up okay and is thankful for the people who helped him. He said he’d like to meet them at some point.